There is often a notion that museum collections are there to be seen and not touched, but here we believe that physical engagement with Museum objects can enhance the visitor experience and help them learn more from our collections. Our contemporary handling trolley has multiple height surfaces to ensure that it is fully accessible and ‘fit for purpose’ for all sizes, ages and abilities. Its surfaces provide ample space to explore our unique objects with all the family. It also offers an array of interactive options that create a fun sensory experience. 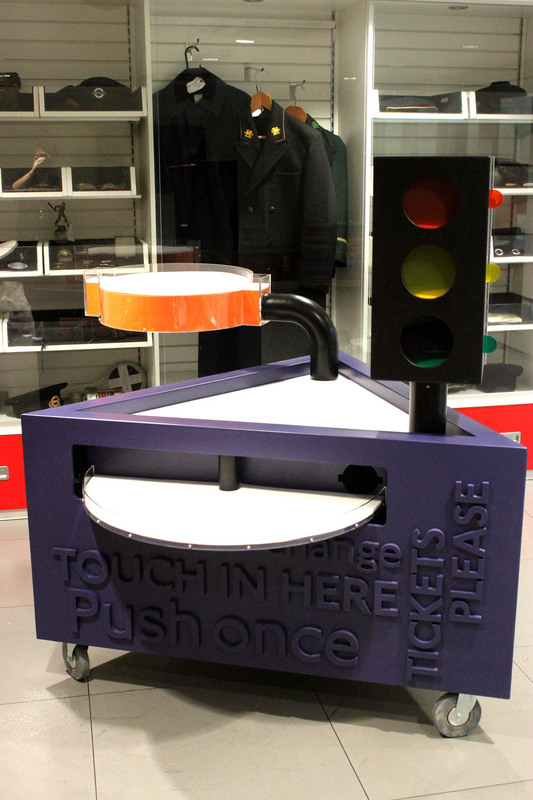 The trolley’s traffic light is another area for exploration, currently displaying our latest handling objects with an ‘On the Bus’ theme, especially for Year of the Bus. Each ‘light’ is home to an object focused on one sense; sound, touch and smell. What’s that smell? Does it feel familiar? Can you guess what’s inside? The trolley has been inspired by iconic London Transport design, including our much loved roundel and Johnston font quoting transport favourites in 3D lettering which lends itself to be explored through touch. 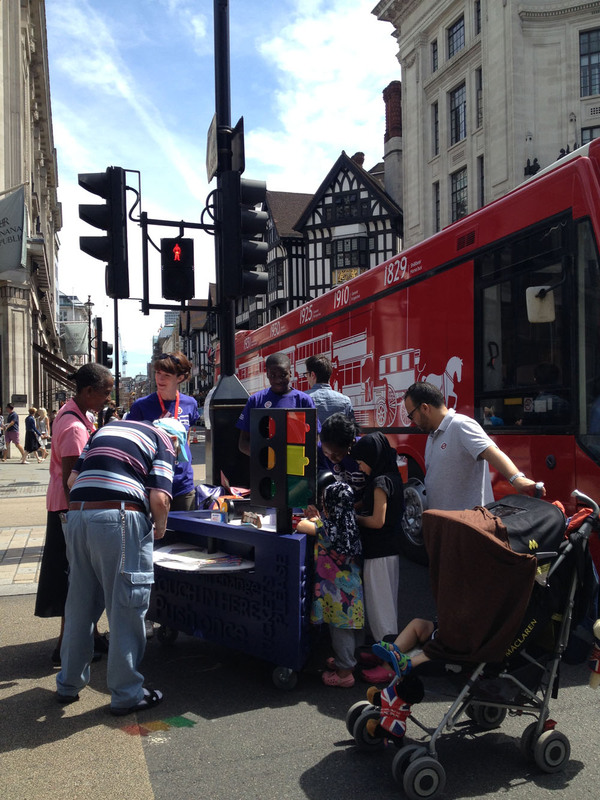 The trolley will be home to 4 handling themes on rotation throughout the summer period. 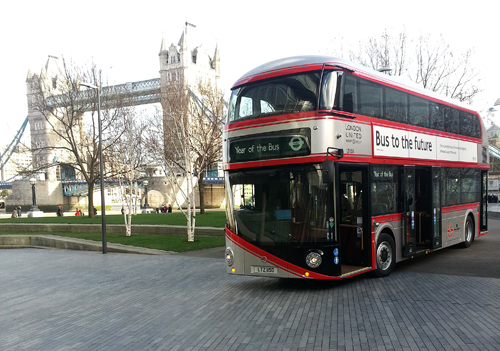 ‘On the bus’, ‘Finding Your Way’, ‘Signalling’ and the family favourite ‘Tickets Please’, which will give our visitors a chance to discover a wide range of London Transport stories in a variety of new and fun ways. 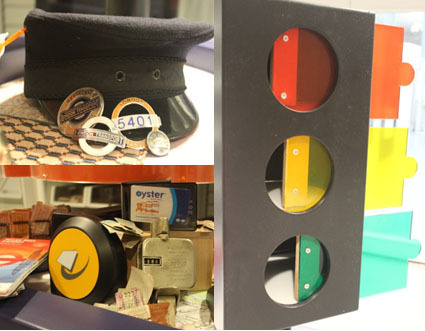 These collections span from tube signalling, to 19th century ticket machines, to 20th century uniforms and 21st century contemporary designs. All are delivered by our wonderful museum staff and volunteers, who are looking forward to sharing their stories with you. The Trolley will be out on Wednesday/ Thursday/ Friday 11-4pm from August 6-29 and will feature ‘Tickets Please’. 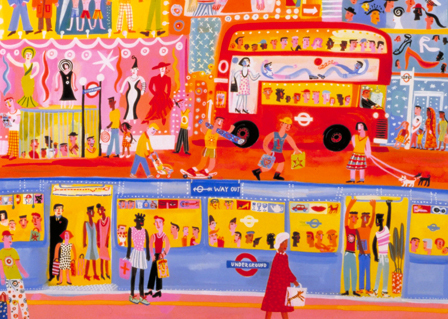 Excerpt from The Bus We Loved; London’s affair with the Routemaster by Travis Elborough. Of course it grew out of and was born into another world. The society it was created to serve was more, or more visibly, stratified. It was a world with a certain intolerance of difference; you might see in its straight rows of seats a reflection of those times. A bus built for a city known for forming orderly queues rather than for wild alcoholic sprees; for a city of parsimonious coupon-snippers rather than designer-label consumers. It’s a bus that by today’s standards can exclude (the disabled, the pushchair). But you can also see a more egalitarian spirit at work. It was designed for (nearly) everyone, and everyone aboard is equal. By its careful, skilful design, it was intended in some small was to elevate an everyday experience. Becoming a bus driver…100 years ago! 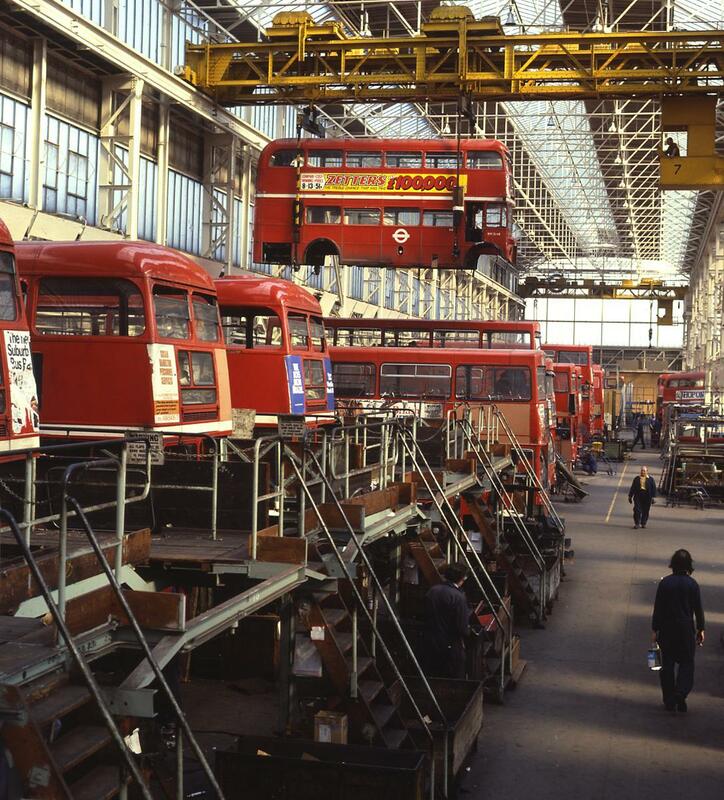 Everyone at London Transport Museum is getting excited about the restoration of the B-type bus. It will be some sight to see it driving the streets of London, and northern France and Belgium, to commemorate the beginning of the First World War. Bus drivers today require special licenses, but what was the situation over a century ago when B2737 was new in public service? For ordinary vehicles, driving licences were introduced courtesy of the Motor Car Act in 1903. Initially issued by County authorities, it was not until 1930 that they were accompanied by competency tests. However, prospective bus drivers had to complete an extensive programme of training and testing before they were allowed on the road. Predictably, if you wanted to drive a bus you had to fulfil the criteria for an ordinary driving licence. For example, any applicant had to be a minimum age of 21 years, have a certificate of good conduct for the preceding three years, and provide a medical certificate of personal fitness. It was down to the particular bus companies to enforce more stringent rules to assist with selection. 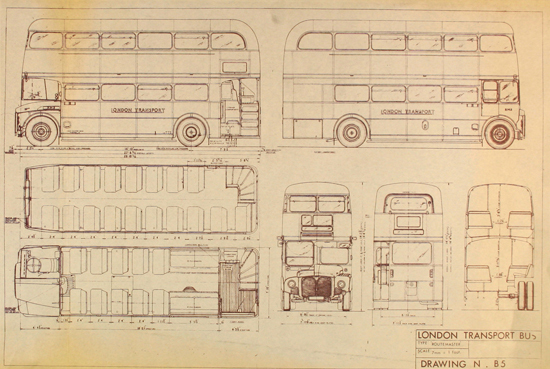 London General Omnibus Company enforced a number of supplementary rules. It raised the minimum age, extended the good conduct requirements to five years, selected married men in preference to single men and selected men with previous driving experience in the streets of London. Applications were made by letter and likely candidates were interviewed. If a candidate did not already possess an ordinary driving licence he was required to obtain one immediately. 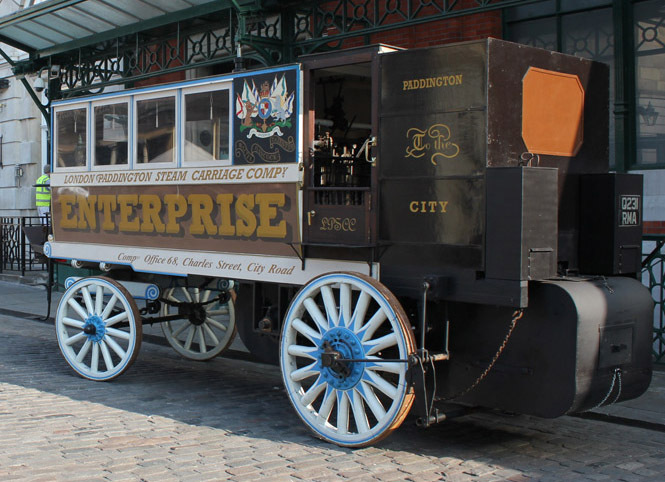 Subject to a successful medical, the applicant travelled down to Scotland Yard to apply for a Stage Carriage Licence (to supplement the ordinary driving licence). The police, in turn, required the equivalent of a P45 and two references. Once these requirements were successfully negotiated, the candidate would finally go to a garage for training. However, there was still no guarantee of a job afterwards and he did not get paid. Training was spread over about five weeks, with a combination of practical and theoretical teaching. Prospective drivers learned about mechanics, road rules and driving in different environments. 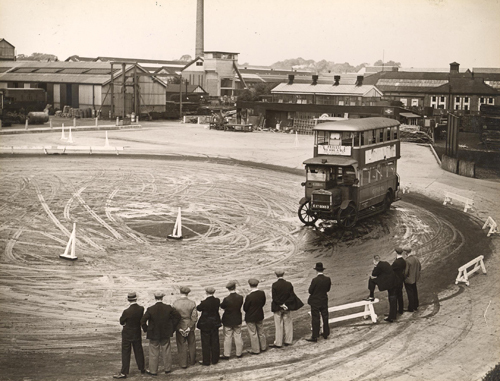 Once trained, drivers took police tests and the Public Carriage Licence test. If successful, the driver was finally allotted to a garage for employment where he continued to train and learn. 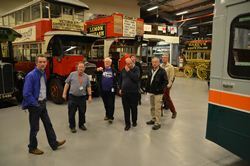 On Friday 21 February, Richard Peskett and his restoration team hosted an event for a range of Museum stakeholders to see the progress being made with the restoration of the Museum’s B-type bus. 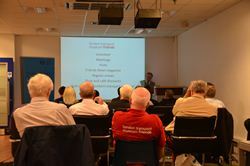 In attendance were key representatives from the Heritage Lottery Fund (HLF), the London Transport Museum Friends, Transport for London, bus operating companies and historians. 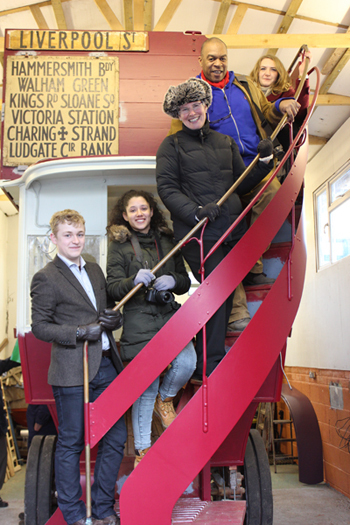 The event was the perfect way to showcase how the restoration of the bus has progressed over the last few months. It was also a chance to get to meet the team behind the restoration and hear more about its fascinating story. A number of discoveries have been made since the restoration began including several tickets and newspaper clippings found tucked behind an original seat in the bus body. Also in attendance was a group from the HLF, who had travelled down to take a look at the bus and to meet the apprentices who had started a few weeks before. The Museum’s Director Sam Mullins introduced the background to the project and the Museum’s programme for the year ahead, while the restoration team spoke on a range of subjects including how the team uncovered the bus’s unique fleet number B2737 and the work to return the engine to operational working order. 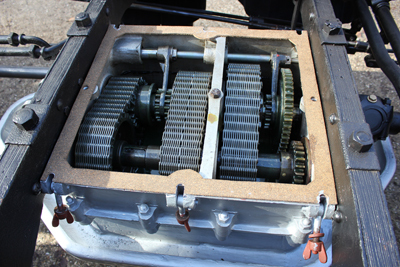 Although the body had not yet been mounted onto the chassis, the visit provided us with a wonderful opportunity to see the beautiful restoration work undertaken on the chassis and the engine. It was thrilling to see parts of the vehicle which won’t be visible when the body is reinstated, such as the gear box and the engine. We were also given the opportunity to see an original seat removed from the body during the restoration, as well as the seating moquette that will be used on the new seats when they are fabricated and the fret work that will accompany them inside the body of the bus. The event was also an opportunity for myself and Gianna Fiore, as the Battle Bus project apprentices, to witness the project for the first time. 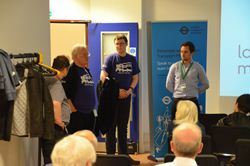 We collected feedback from the visitors and both thoroughly enjoyed the event and the chance to meet the key stakeholders in the project. Even though it is not completed yet it was still impressive to see the bus chassis and the body mid restoration. It was the first time I had seen the bus and after weeks of hearing about it and seeing pictures it was a real thrill to see it with my own eyes. 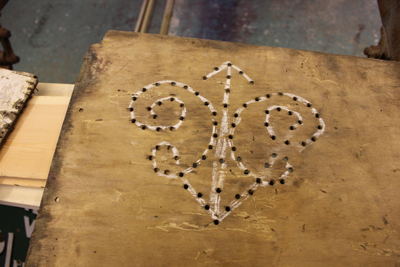 It was equally fantastic to meet the people behind the restoration and hear some of the fascinating stories unearthed during the restoration process. It was also a pleasure to meet representatives from the HLF who have funded the project, including our Project Grants Officer Laura Butcher, London Committee Member Jennifer Ullman and Wesley Kerr, Chairman of the London Committee. Having now seen the half completed bus, I can’t wait to see the bus in all its glory this summer. Having visited Haslemere to view the progress of the restoration, Gianna couldn’t wait to get started on the upcoming project. She enjoyed the opportunity to meet all the interesting people involved in the project, incuding the project funders from the HLF (and was fortunate enough to interview some of our guests and get their views on the project.) Gianna discovered that two people had even written books about B-type buses and was excited to find one stocked in our very own library at the Museum. The Safety First Campaign had its own publicity emblem – a white triangle with red interior lines and the words ‘Safety First’. The rise of motor traffic in the Edwardian era led to an unprecedented rise in accidents. Pedestrians accustomed to the slow meandering nature of horse vehicles were unprepared for the speed of new buses like the B-type. The increase in accidents sparked a number of public safety initiatives. 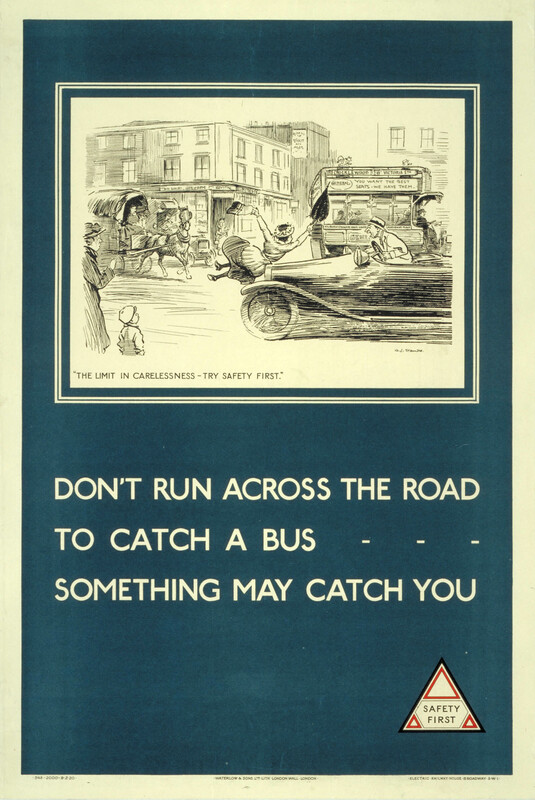 Starting in the 1910s, the Safety First campaign used posters to emphasise the correct behaviour passengers and pedestrians should employ when near buses. 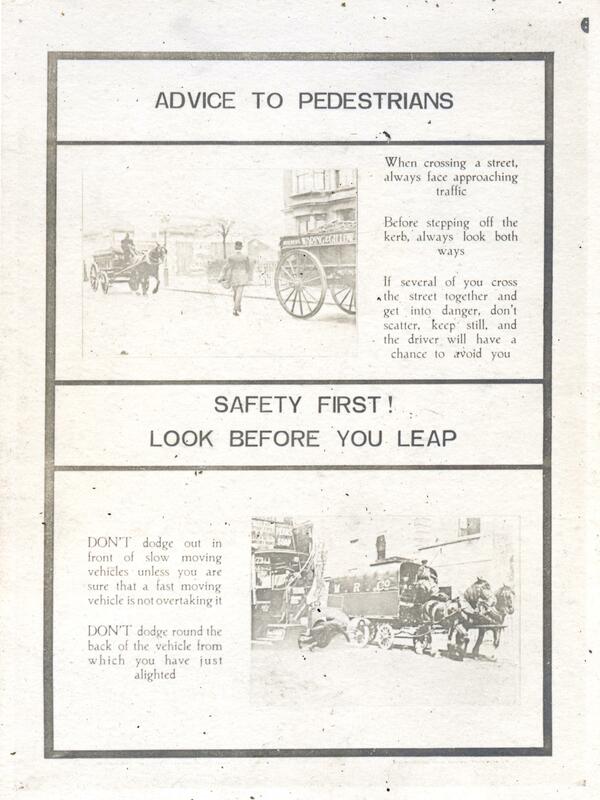 One poster strictly explained how to alight a B-type bus in a safe manner, whereas others exclaimed ‘look before you leap!’ This latter point seemed to be a common problem, as passengers were accustomed to leaping on and off transport because traditionally it had been so slow-moving. The advent of faster motor buses meant this became considerably more dangerous. One 1915 poster underlines this problem with speed. It read ‘don’t dodge out in front of a slow moving vehicle unless you have made sure that a fast moving vehicle is not overtaking it’. Graphic drawings and photographic mock-ups of accidents were used as a shock tactic to encourage people to act safely. The staff magazine of the time, called Train Omnibus Tram (TOT), also expressed the importance of Safety First and of being cautious while using the transport network. Photos from training classes show instructional Safety First posters plastering classroom walls, and there were awards for drivers whose record was free from accidents. Safety is still a high priority for Transport for London. 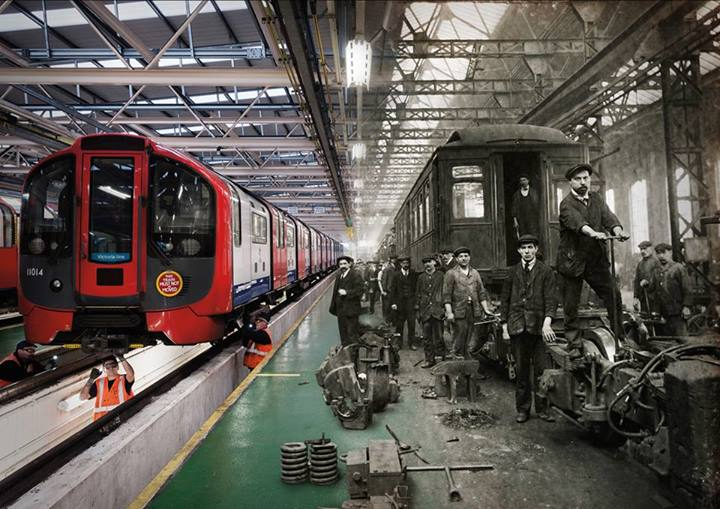 It runs a programme, based at London Transport Museum, called Safety and Citizenship which aims to promote safe and responsible behaviour amongst young people on London’s transport system. The team visit schools across London, organising activities to improve understanding of safety on the network. Transport for London also runs a continuous safety marketing campaign. Although today’s messages may have slightly different priorities, the notion of responsible behaviour as originally described in the initial ‘Safety First’ campaign is still relevant today.